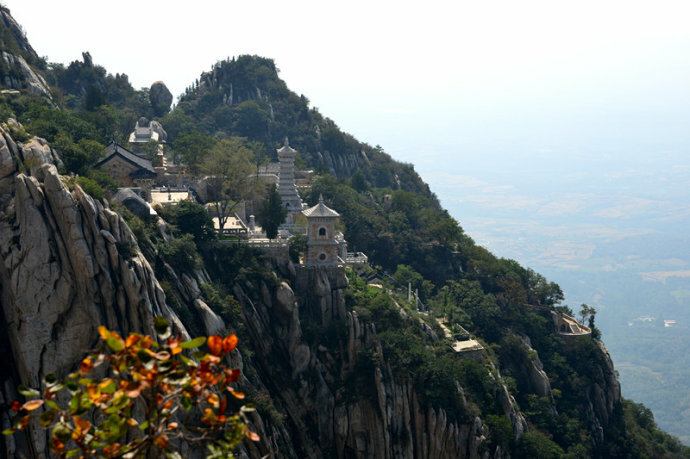 Rising up at the heart of Henan province, Mount Song ranks as one of the Five Great Mountains of China. Its location in relation to the other five mountains means it is often referred to as Zhongyue or the “Central Mountain”. These mountains are known simply as the Five Great Mountains or the Five Great Sacred Mountains because they achieved a profoundly spiritual status during the Warring States Period (c. 476-221 BC), long before Confucianism, Taoism, or Buddhism had taken an important role in Chinese religious belief. In many ways, the mysticism imbued within these mountains pre-dates modern religion, and they unsurprisingly remain a source of fascination for tourists from across the globe. The mountain range itself rests just outside of the city of Dengfeng, approximately 80 kilometres (50 mi) from the provincial capital of Zhengzhou, and can be separated into two major peaks: Mount Shaoshi and Mount Taishi. In total, it stretches for a whopping 70 kilometres (43 mi) from east to west and is made up of 72 separate peaks, with its summit towering in at 1,500 metres (4,900 ft.) in height. When it comes to tourism, the range has been conveniently divided into three sections: the Shaolin Temple Scenic Area, home of the Shaolin Temple; the Zhongyue Scenic Area, named after the ancient Zhongyue Temple; and the Songyang Scenic Area, where you’ll find Songyang Academy. Altogether they represent a wonderland of lush valleys, deep caves, shimmering lakes, rippling waterfalls, and historic temple complexes. 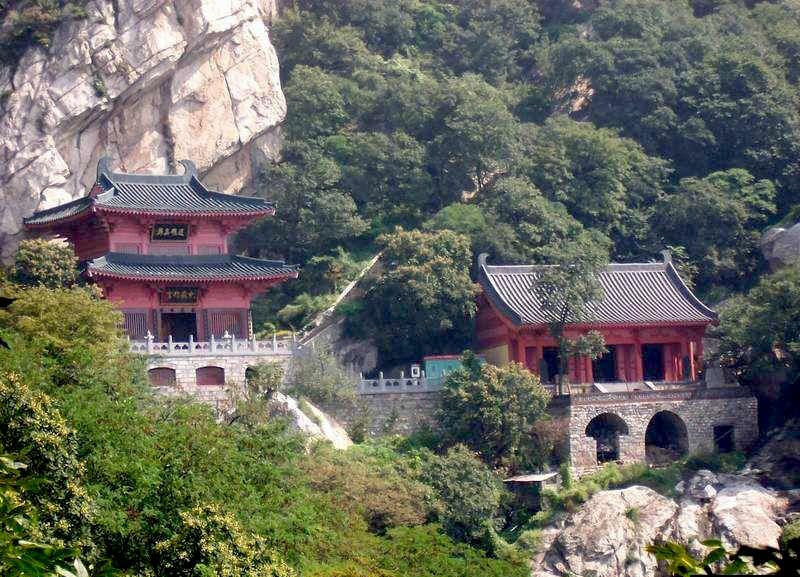 Arguably the most famous of these is the 1,500-year-old Shaolin Temple, which is dedicated to the Chan (Zen) sect of Buddhism and heralded as the birthplace of Shaolin Kung-Fu. The colossal impact that this temple has had on the history of Buddhism and martial arts meant it was designated a UNESCO World Heritage Site in 2010, along with the nearby Pagoda Forest. Nowadays, martial artists and tourists from all walks of life flock to the temple to admire its elegant buildings and marvel at its daily Wushu Kung-Fu performances. 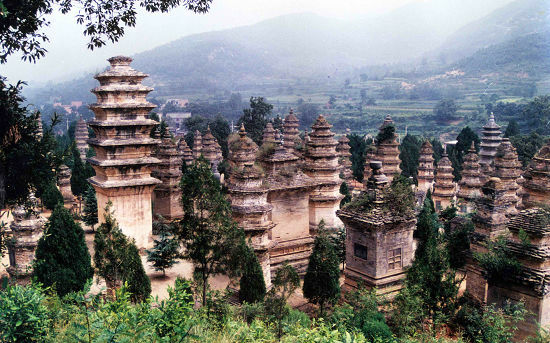 The Pagoda Forest itself is equally as impressive, being the largest of its kind in China. It contains over 240 intricately decorated towers, all of different shapes and sizes, the oldest of which date all the way back to the Tang Dynasty (618-907). Yet the name “Pagoda Forest” can be somewhat misleading, since it is not a forest and the buildings aren’t actually pagodas! They are more like tombs or monuments, since each one was constructed to commemorate the death of an abbot or famous monk from the Shaolin Temple. Zhongyue Temple in the Zhongyue Scenic Area carries a similar, if not more remarkable, historical pedigree. Dating all the way back to the Qin Dynasty (221-206 BC), it is one of the oldest Taoist temples in China and is largely regarded as the most well-preserved ancient building among any on the Five Great Mountains. However, the scenic area is also home to two lesser-known delights: the Luya Waterfall and the Gaocheng Astronomical Observatory. The Astronomical Observatory was originally built by the astronomer Guo Shoujing during the Yuan Dynasty (1271-1368) and, at the stately age of 700 years, it is the oldest of its kind in China. It serves as living proof that, even in ancient times, people would still look to the stars for guidance! As with the other two scenic areas, the Songyang Scenic Area is centred on an ancient building of undeniable prestige. Dating back to the Northern Wei Dynasty (386–535), the Songyang Academy is heralded as one of the Four Great Academies of ancient China. Famous Confucian scholars such as Sima Guang and Cheng Yi would travel for miles simply to give lectures at this venerable establishment. At its height during the Qing Dynasty (1644-1912), it housed hundreds of students and boasted a library complete with over 2,000 books! The nearby Songyue Pagoda, which was also built during the Northern Wei Dynasty, is the oldest surviving brick pagoda in China. If you want to fully appreciate all of the wonderful attractions that Mount Song has to offer, you’ll need to set aside at least two days for in-depth exploration. There are a number of small towns in the surrounding area offering accommodation and, to the west of the Shaolin Temple, there is even a village embedded halfway up a cliff! The village of Sanhuang has become famous for its precarious position, and is a popular rest stop for hikers traveling up the mountain. Just be sure not to look down!